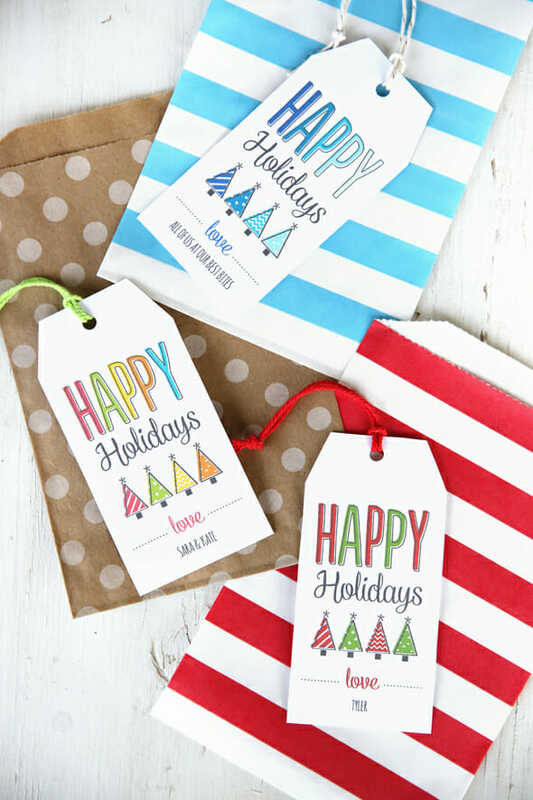 On Friday we shared a bunch of our favorite holiday treats, and some darling free holiday gift tags. Happy news for all of us: The Little Umbrella added FOUR new additional tags for a full suite of awesomeness! All five of these tags are free and customizable. Look at these and tell me you are not swooning! It’s seriously so much fun. And Kate and I are dying over the new designs. Look at that Baked with Love one! 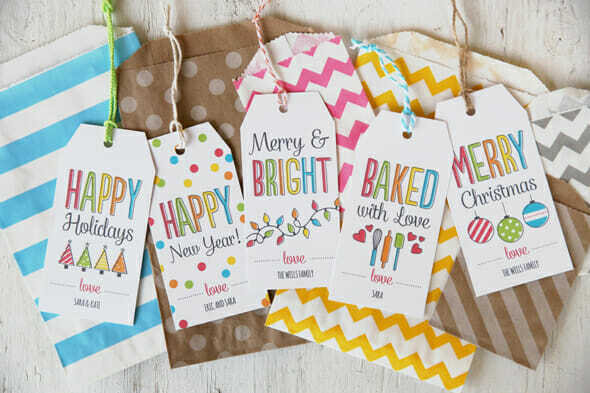 These are absolutely adorable and can’t wait to create some for my holiday gifts. THANK YOU! Thank you so much! They are so cute and were so easy to use! Love these! Thank you! I’m a font addict–any chance you could tell us which fonts you used? Hi, Heather! We used Populaire for the big all caps letters, Rhyme Casual for the script font, and the font at the bottom is Amatic (bold). Thank you, thank you! I need to do teacher and neighbor gifts this week and these will make it so much easier! Plus they’re way cuter than anything I could come up with. I love the Merry Christmas one. I’ve customized and printed the adorable tags; thank you! Also, I ordered your blood orange olive oil and raspberry balsamic. I cannot wait to use them together on a salad! Merry Christmas! Oh my heck! These are so cute! Thank you so much! These are seriously the cutest things ever! I am so in love and just want to keep playing with them, printing and customizing over and over again! I think all our Christmas gifts might get these tags! I love them!! Just wondering if this program can be installed on a Mac. I tried to install it , it said it was installed and I can’t find it anywhere. Check your downloads folder–that’s where mine go. 🙂 Hope that helps! thank you so much for these free downloads.More power! Thank you ! These are darling tags! I love how colorful and personalized they are. Thank you for sharing your talent! Thank you so much! I can’t wait to use these on my gifts this year!! These are so amazing and creative! Thanks for making these. love these! using them on gifts for the teachers and staff at my kids’ school. thanks for sharing! THANK YOU SO MUCH! ALL OF THEM ARE BEAUTIFUL! 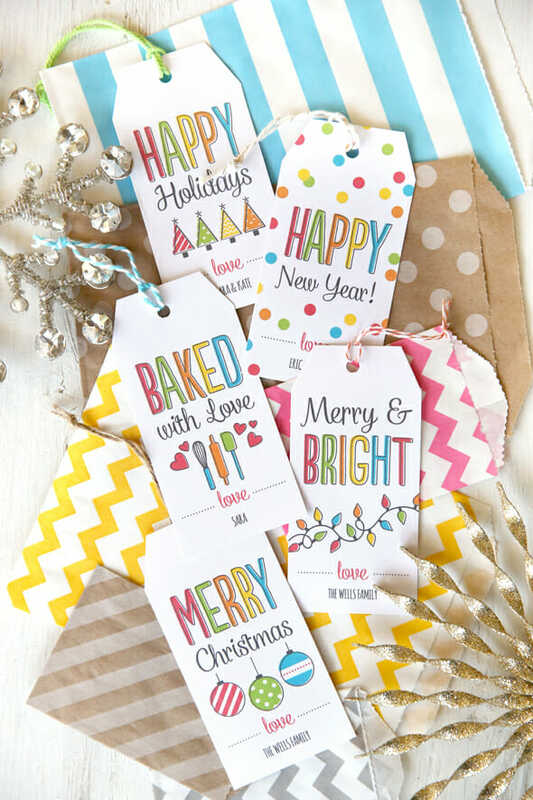 I have been scouring Pinterest for DAYS looking for the perfect customizable printable gift tags! Thank you, thank you, thank you – these are amazing!! ❮ Previous Post Previous post: Blogger Christmas Cookie Exchange!